When it comes to hazardous materials, impulse decisions can have serious consequences on the environment. Emergency responders must make those kinds of decisions, but not when selecting a certified hazmat suit. Weight and maneuverability directly affect endurance and safety out in the field, making them two of the most important considerations when selecting an NFPA 1991 certified hazmat suit. The most notable factor influencing weight is the number of layers used to produce the suit. Single-skin suits are advantageous, as their overall thinness often makes them weigh less than their multi-layer counterparts. Selecting a single-skin suit can save as much as 8 pounds. For an emergency response worker, each pound spared is a welcome relief on the joints and heart. Single-layer suits also facilitate a wider range of motion, allowing hazmat personnel to maneuver both hands and body easily, while operating inside the suit. Material is the foundation of any hazmat suit, and it can mean the difference between protection and exposure. 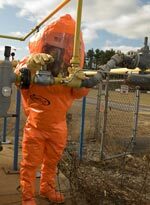 If a product has received NFPA 1991 certification, the material has passed an abrasion test and will be able to combat chemical permeation in the event of damage to the suit while in use. During the test, sandpaper is used to abrade the suit’s material. After the material has been abraded, the suit is tested to ensure chemicals are not able to permeate the remaining material. Composition of the material also will provide clues to its durability. Material can be composed of fluoropolymers, rubbers, or thermoplastics. Fluoropolymers offer the greatest temperature resistance as they are able to withstand heat up to 500 degrees Fahrenheit with no material degradation. Thermoplastics generally melt when exposed to temperatures as low as 300 degrees Fahrenheit, and rubbers are often stiff and heavy. When evaluating fit, responders should consider each component as well as the complete ensemble. Dexterity is the key test when trying on gloves. Traditional multi-layer glove systems have poor dexterity, making it nearly impossible to bend the fingers. Multi-layer gloves also have a tendency to invert, making reinsertion of the hand difficult. If a hazmat tech has just finished using his radio, he must have the ability to reinsert his hand quickly. Single-piece gloves provide greater dexterity, making removal and reinsertion of the hands a simple task. A single-piece construction also means that no layers can be physically removed, ensuring consistent, maximum protection. Whether fixing a gas leak or navigating through toxic chemicals, an emergency responder must be able to see what he or she is doing. Often, suit visors will hang loosely on the face, causing poor visibility. This is sometimes the result of a poorly fitting suit. The visor should rest comfortably and securely across the brow line, using the internal pressures of the suit. Some of the more durable constructions have the visor directly welded into the suit’s material. Not all suits have an internal belt system. Look for suits that include this feature, which couples the suit to the user’s waist to increase the range of motion and overall suit function. Internal belts promote stability by holding the suit up at waist level, subsequently easing pressure off the neck and head. It is common for integral booties to bunch up inside the overboot. This results in discomfort while standing and walking and can ultimately affect safety by making it difficult to walk. To prevent this problem, some integral booties are composed of soft material, which remains very comfortable when inside the overboot. This is a small feature that makes a big difference. Frequently, suits can be too rigid or stiff, making it difficult to maneuver while in dangerous situations. When trying a suit on, a responder should squat down, bend over, and reach his or her arms high into the air to see if the movement is fluid, not strained by the fit of the suit. Maintenance is important from both a safety and cost-savings perspective. Two elements that affect maintenance are shelf life and exhaust valves. A common shelf life is five years. Some suits exceed that by offering 15 or more years. Also, note that some suits contain exhaust valves, which carry their own maintenance requirements. For these products, users should be aware that they will need to change the rubber diaphragm in the valve every two years. Some valves require no maintenance at all. Finally, while these elements are important to consider when selecting a certified hazmat suit, the most basic step is to take it for a test walk.